Electric lawnmowers have some features that their gas-powered cousins just cannot match: these mowers have a lot less recurring costs over their lifespan (no dealing with gas, oil changes, spark plugs, etc. ), electric mowers are almost always lighter, and they’re better for the environment. Electric lawnmowers come with a lot of different features. Some are corded, some cordless, others are self-propelled. We’ve outlined all the options below so that you can know which one is the best electric lawnmower for you. Snapper’s mower is a great pick for those who want a powerful electric self-propelled lawnmower. 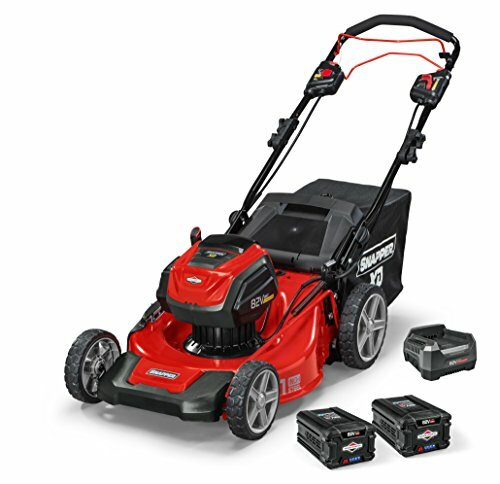 Snapper’s XD mower comes with a 21-inch cut diameter and 2 Ah batteries with a rapid charger. Each of these batteries should get you up to about 45 minutes worth of run time depending on your grass thickness and the speed setting of your mower. The rapid charger can get a battery at max power in 30 minutes, so if you have a big yard or very thick grass, you should be able to charge one battery in the time it takes you to use up the other one. Snapper’s mower comes with smart load-sensing technology that can detect how much power it needs to expend to get your grass cut. This technology goes a long way towards saving your battery life. The XD allows you to choose between side-discharge, mulch, and bagging options for your grass. We discuss these options later in the Q&A section so you can decide if you need all these. The mower comes with 7 height adjustment options ranging from 1-3/8″ to 3-3/4″ so you can trust that you’ll be able to customize the yard how you want it. This mower is rear-wheel drive. This mower comes with adjustable speed options and a one-button push start. It is an electric mower, so you can expect your initial investment to be high (unless you get the no-battery-included option), but you’ll never need to worry about gas, oil changes, spark plugs, or the other possible frustrations of a gas mower. 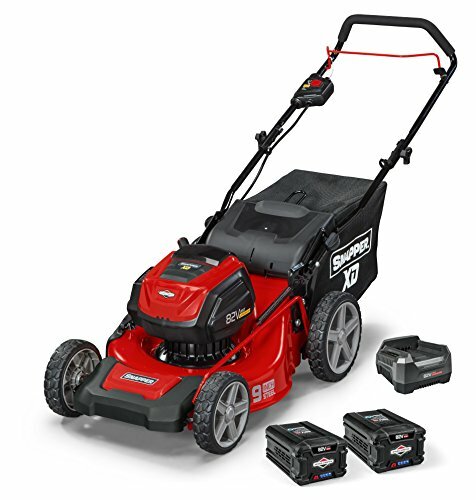 This mower comes with a long 5-year warranty on the mower and a 2-year warranty on the battery and charger. It’s nice to see a manufacturer support their work for so long. All-in-all, this is a great mower for those who are wanting all the bells and whistles: self-propulsion, multiple cutting options, different heights, a long warranty. It’s a good pick for if you’re wanting a higher end mower. Snapper’s 19-inch cordless electric lawnmower presents us with an option that is all that the industry should be. This is a great mower for a wide range of yards from very small to pretty stinkin’ big. This mower comes with 7 levels of height adjustment ranging from 1-3/8″ to 3-3/4″. Height can be adjusted using a lever, but some buyers said that the lever was a little hard to use. This mower isn’t too heavy but is one of the heftier options. It weighs 59.5 pounds and the handles can fold, so storage shouldn’t be difficult. This mower packs a punch and it has a larger cut diameter than many other options, but that power comes at a price: this thing is heavy when compared to other electric mowers. 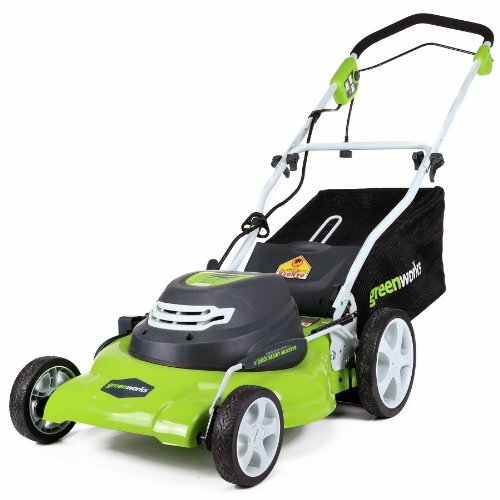 This Greenworks mower has a 20-inch diameter and at 12 amps, will cut through grass that you’ve let grow for a bit. This mower also comes with the attachments to cut, collect, and mulch your grass. We discuss the differences in these three options later on, but for now, just know that this mower can be used for a variety of yards with a variety of desired looks. 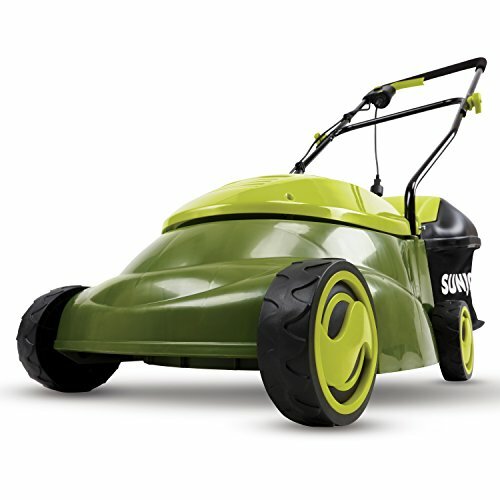 The handles fold up for easy storage and the mower weighs about 56 pounds, so it’s much easier to push than a gas mower or even a battery-powered one. That said, it’s not the lightest mower. If you just want the most compact option available, it’s up next. The Sun Joe 14-Inch is one of the smallest, lightest, and most budget-friendly options on the market today. It has a smaller cut diameter of 14 inches so this mower is better suited for smaller yards. Even though the cut diameter is on the smaller side, the mower allows for 12 amps so it can cut through thicker grass. This mower has 3 height adjustment options ranging from 1-1/4″ to 2-1/2″. One negative about the Sun Joe is that it doesn’t come with options to mulch or side discharge your grass. The mower itself comes with an 11-gallon bag, which isn’t very much at all. If your yard is anything other than tiny, you’ll find yourself emptying the bag quite a bit. One solution to this problem is to take the bag off. You’ll get a lot of grass on your legs, but it may be a little more convenient since you’ll save a lot of time emptying the bag. There is a side-discharge option available on Amazon, but it needs to be purchased separately or with the Pro Version. This mower allows you to fold up the handles for easier storage and it weighs in at 29 pounds, so it can probably be mistaken as a large children’s toy from a distance. This won’t help you in your neighborhood “Who’s Got the Most Horrifying Lawnmower” contests, but it makes this mower easy to handle. It’s a good option for anyone who has trouble handling a larger mower. The Sun Joe comes with a 2-year warranty. This mower is great for those who have a small yard or have trouble using heavier mowers. This is the best budget buy on our list. Each electric lawnmower we’ve listed above has its own distinct features. In the headings of the post, we specified when a mower is self-propelled, battery-powered/cordless, and when a mower needed to use a cord. It can be hard to know which one you need, so we’ve broken it down for you below with descriptions on which type of mower is best for what. Self-propelled electric lawnmowers use their own engine to propel themselves forward. This self-propulsion makes pushing easy since you won’t have to do the work, but turning can be a bit more of a challenge. These types of mowers are the best for large yards where you won’t have to worry much about maneuvering around natural areas or other contours. Battery-powered electric lawnmowers and cordless electric lawnmowers are just what they sound like: these mowers use a rechargeable battery pack (like the self-propelled mowers) but these mowers don’t self-propel. Since they don’t self-propel, the battery-powered cordless mowers will often have a stronger cut or will have batteries that last a bit longer. These mowers are ideal for medium to large sized yards where you don’t mind doing the pushing or where you will need to be doing a lot of turning. Corded electric lawnmowers will need to be plugged in using an extension cord (we explain what kind of cord in just a second). These mowers are almost always on the less pricey side of electric lawnmowers, but are best suited for small yards due to the inherent lack of range that comes with using an extension cord. What’s the Deal with Amps, Gauges, and Cords? If you are going the corded rout, any corded electric lawnmower you buy will need an extension cord for use (if your mower isn’t corded, no need to worry. Feel free to skip to the next section). Having the right cord is the difference between long life and an unexpected demise for your lawnmower. Having a cord that doesn’t allow enough power to get through will cause your mower engine to strain and break sooner than it should. Many a once-happy buyer have been upset because their mower stopped working too soon and many of these motors break for no other reason than someone didn’t know that their cord needed to allow more power to get to the lawnmower. So how do we make sure that your cord is right for you? First, we have to take a look at how cords work (and we’re going to skip all the technical jargon so no worries). Cords are a way to transport electricity from an outlet to something else (in this case, your corded electric lawnmower). Each cord is rated for a certain amount of electricity depending on how thick the wires inside the cord are. This is called a gauge. Gauges work backward, so the lower the gauge, the thicker the wire. The thicker the wire, the more electricity that can be carried. You’ll also want to keep an eye on how long your cord is and make sure that it’s rated for a low gauge at a certain length. The lower the gauge, the more electricity your cord can carry. Extension cords that you can buy for your lawnmower will often have the gauges specified in the item description as numbers (16/3, 12/3, etc. where the first number is the gauge) or as AWG (12 AWG is 12 gauge). Getting too high of a gauge will kill your corded mower, so this is an important part of your decision. Another thing to look out for in your cord is color. It’s best to go with a color that stands out from the color of your yard, like a red or orange. Green or brown cords can get lost and running over those with your lawnmower may give you a thrill you’ll never forget. For all the mowers listed, we recommend at least a 12-gauge, 100 ft wire. This one is a good option since it will be strong enough to power your lawnmower and will give you enough reach to get the far corners of your yard. If you want to be extra safe, you can try this 10 gauge, 100 ft wire. It should be able to provide enough power to launch any rockets you’re building in the backyard, too. Whichever cord you use, make sure that it’s rated at least a 12 gauge at 100 feet. Your corded lawnmower will thank you (and will last a lot longer). If you would like to read more about the science behind wires, amps, ohms, and gauges, you can do so here. If you didn’t notice, electric lawnmowers come in a wide range of sizes from 14 inches all the way to 21 inches – over half a foot difference! In general, the smaller mowers are more suited to budget buyers. It’s worth keeping in mind that the bigger the mower, the fewer passes you’ll have to make through your yard. Here is a little chart that may give you an idea of how big of a mower you’ll need. The cut width is in centimeters. Over the course of a few years, you may end up saving yourself a good bit of time with a larger mower. Larger mowers are not always better though. If your yard has a lot of natural areas, landscape borders, raised gardens, turns, corners, or a lot of things that will need to be mown around (like an in-ground fire pit), a larger mower may end up causing more trouble than it’s worth. Smaller mowers are always easier to maneuver and a lot lighter when you’re turning. If your yard will require a lot of maneuvering or if you’re looking for budget-loving options and don’t mind taking an extra couple of passes in the yard, we recommend getting a smaller mower. If your yard isn’t tough to get around and you’re lacking natural areas, we recommend going with the bigger mower if you can afford it. In cordless electric lawnmowers, the battery can be one of the biggest distinguishing factors between mowers, so it’s important to choose the option that’s right for you. It’s helpful to remember that one of the biggest expenses of maintenance for your cordless mower will be your battery. You’ll never have to change the oil, spark plugs, or refill on gas, but one day your battery will give out on you. For that reason, we at OwnTheYard recommend mowers that come with 2 batteries. Having a mower with more than a single battery will be helpful when one battery gives out on you after the warranty, but will also help ensure that you get a longer mowing time. 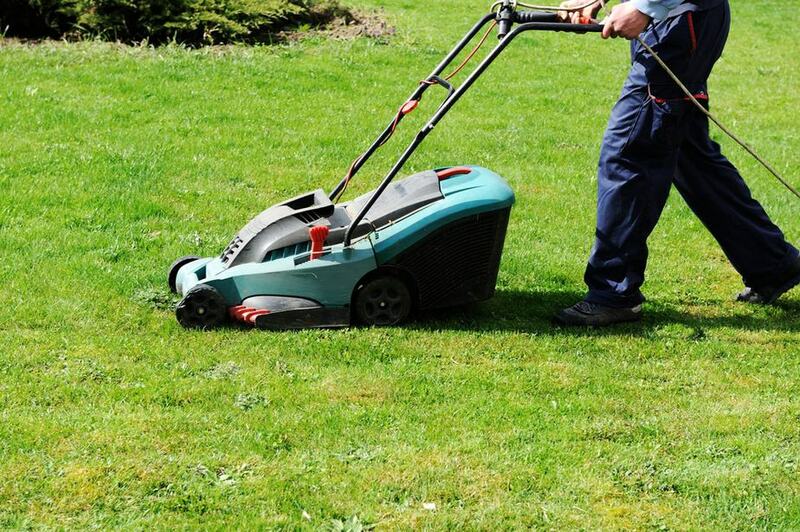 Perhaps your grass is extra thick one week or you forgot to recharge your battery after your last cut – you can pop that extra battery in and get to work. In addition to a mower with 2 batteries, it would be a good idea to go for a mower with a battery warranty of at least 2 years. This will protect you from that extra possible expense until you have time to get your money’s worth out of your mower. Sun Joe started as a Snow Joe: a company producing electric snow shovels. As the company began to fill a need for clean electric equipment, they began expanding their product line. Now offering the Snow Joe and the Sun Joe, this company has you covered come snow or shine. Thanks for reading our guide on the best electric lawnmower! When it comes down to it, the best option for you is going to be the one that suits your unique needs best. Take note of the size of your lawn and whether you’ll want a self-propelled, regular battery-powered, or corded electric lawnmower. Ask yourself what you want your yard to look like and how you want it cut – are options like side-discharge, mulching, and bagging important? Last, take a look at your budget. We’ve reviewed lawnmowers from the high end picks to the most budget-friendly options, so there is surely something for everyone. Our top self-propelled pick is the Snapper 21-Inch. If you’re looking for the best battery-powered or cordless electric lawnmower, we recommend the Greenworks 21-Inch or the Snapper 19-Inch. 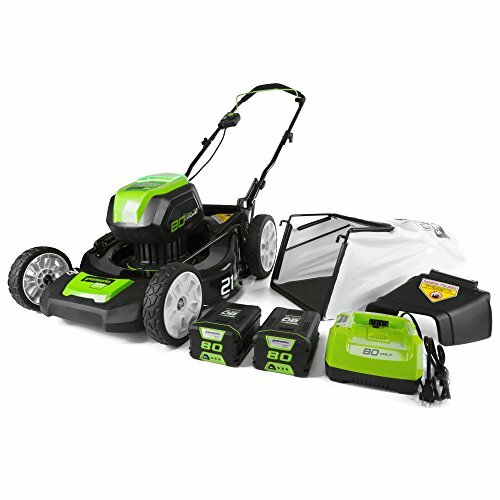 For corded mowers, we suggest the Greenworks 20-Inch or the Sun Joe 14-Inch (these are also great budget buys). The best electric lawnmower for your needs will be the one that can get your yard just how you like it, so don’t be afraid to take a little time looking around and being a little picky. There’s something for everyone here.